One year before the founding of the Shenzhen Special Economic Zone in August 1980, Shenzhen was a minor fishing village located in Bao’an county. On January 31, 1979, the Chinese government agreed to establish the Shekou Industrial Zone, which proved to be a testing site for the Shenzhen that we know and love today. Up until that point, Shenzhen had been a small town and administrative seat in Bao’an county, having taken that distinction from Nantou in 1953. Shenzhen was designated as a city in 1979, with the location of early Shenzhen generally regarded as Dongmen, Luohu District. Shekou, on the other hand, was merely a customs office in Bao’an county, until the China Merchants Company were given the rights to develop the Shekou Industrial Zone in 1979, with Yuen Geng, who had been an early proponent of the policy of reform and opening up, at the helm of operations. On April 1, 1979, construction of Chinese Merchants Company headquarters in Shekou began and in July of the same year, the company broke ground on the Shekou Industrial Zone. Geng was an economic pioneer and visionary, and developed an atmosphere of freedom in the small southern area, organizing local elections and developing access to housing for local workers. He was much beloved as a pioneer of reform and opening up. Soon after the establishment of the Shekou Industrial Zone, the area gained a reputation for innovation, while infrastructure grew rapidly, and local officials in charge of the project encouraged an environment of trade incentives and friendly investment policies. Soon Shekou developed into an export-oriented trade zone. In addition, foreign oil companies, and oil workers, came to Shekou as the local government pushed to attract companies to build rigs out in the South China Sea. Connected to Macau and Hong Kong by ferry, Shekou became a hub of activity, with the likes of Shekou International School, the Shekou Hash House Harriers and the Snake Pit, opening up in the area. When Deng Xiaoping visited the city in 1984. He made a stop at the Minghua cruise ship in Shekou. In her Shenzhen Noted blog, Mary Ann O’ Donnell says that the ship was originally French and christened by Charles de Gaulle in 1962. 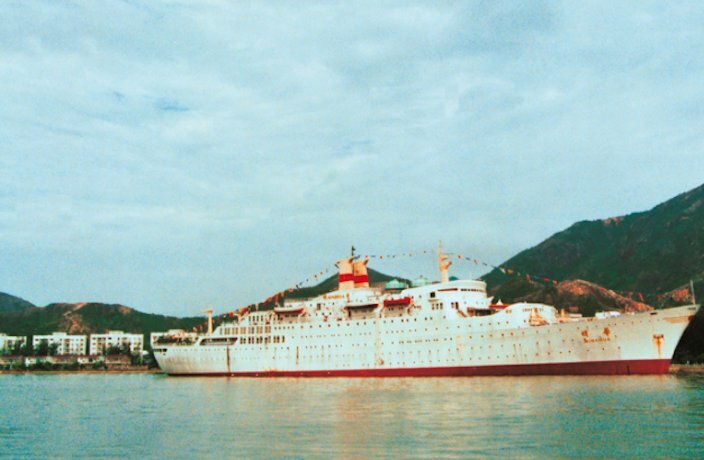 The Chinese government later bought it and transported it to Shekou in 1983, to be used as a floating restaurant and night club. After seeing the impressive schooner, Deng Xiaoping dubbed the area surrounding the Minghua cruise ship, Sea World. As Shekou developed, it broke off from Nantou to form its own district in 1984, and it wasn't until September 1990 that the two came back together to form modern Nanshan District. Now with the Shekou, and Shenzhen, experiments having achieved overwhelming economic success, development on a new phase of Shenzhen’s history is beginning to take flight as a new economic center in Qianhai rises on the opposite side of the Nantou peninsula from Shekou. Perched in a strategic position, within easy commuting range of both Bao’an International Airport and Shekou Port, Qianhai is set to bring about another stage of development in the city. What will Shenzhen look like in another 40 years? We guess time will tell. This was the first time that a top Chinese leader visited America since the founding of the PRC in 1949.